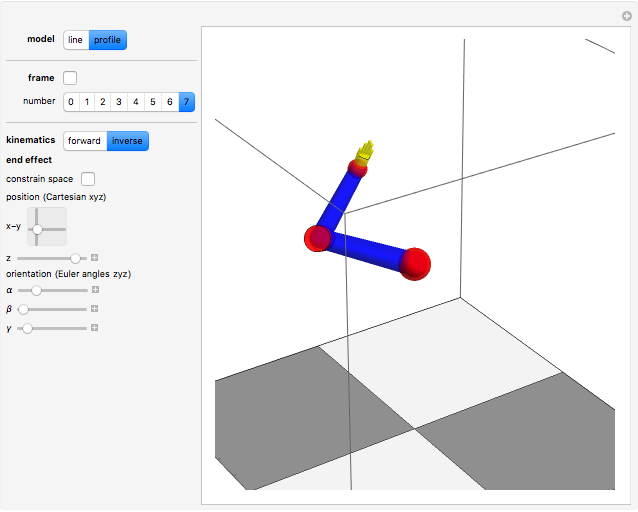 The anthropomorphic arm with seven degrees of freedom (DoF) includes redundancy, since the number of joints ( ) is greater than the dimension of the manipulation variables, which have three position coordinates and three orientation angles ( ). 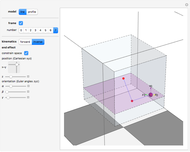 Although the set of nonlinear trigonometric equations cannot typically be solved analytically, there are some robot structures that are solvable analytically. 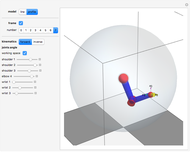 Pieper proposed a decoupling method ; the sufficient condition for solvability is when the 6-DoF robot has three consecutive revolute joints with axes intersecting in one point. Another generalized inverse is the inertiaÃ¢ÂÂweighted pseudoinverse Jacobian matrix, a kind of resolved motion rate control technique, proposed by Whitney , which is used to minimize energy by using the inertia matrix as the weighting matrix. This Demonstration solves the inverse kinematics of a 7-DoF anthropomorphic arm with a decoupling hybrid algorithm. It uses a Newton–Raphson numerical technique and a pseudoinverse Jacobian matrix to solve the shoulder and elbow 4-DoF component for end-effector position and applies an analytical method to solve the wrist 3-DoF component for end-effector orientation. D. L. Pieper, "The Kinematics of Manipulators under Computer Control," (Stanford Artificial Intelligence Laboratory Memo, No. AI-72), Ph.D. dissertation, Computer Science Department, School of Humanities and Sciences, Stanford University, CA, 1968. www.dtic.mil/cgi-bin/GetTRDoc?AD=AD0680036. D. E. Whitney, "Resolved Motion Rate Control of Manipulators and Human Prostheses," IEEE Transactions on Man-Machine Systems, 10(2), 1969 pp. 47–53. doi:10.1109/TMMS.1969.299896. B. Siciliano, L. Sciavicco, L. Villani, and G. Oriolo, Robotics: Modelling, Planning and Control, London: Springer-Verlag, 2009 pp. 39–160. R. N. Jazar, Theory of Applied Robotics: Kinematics, Dynamics, and Control, 2nd ed., New York: Springer-Verlag, 2010 pp. 357–363. Frederick Wu "Kinematics of a Redundant Anthropomorphic Arm with Seven Degrees of Freedom"